What happened to Dr. Walter Mzembi, former minister of Tourism and Hospitality for Zimbabwe, and former candidate for UNWTO Secretary-General? Dr. Mzembi is currently getting medical treatment battling cancer in South Africa and is frustrated. He is trying to understand where the African tourism family is when one of its own is being persecuted? There are many indications Dr. Mzembi is being harassed while we all watch. They have persecuted him for nearly a year now, on some incomprehensible criminal charges brought up by the new government in Zimbabwe. Such charges touch on the integrity of the UNWTO itself. It’s a seemingly sophisticated witch hunt meant to discredit his legacy with the UNWTO, where he with distinction led the Commission for Africa from 2013 to 2017 for two consecutive terms. Mzembi set the agenda for continental tourism policy formulation. 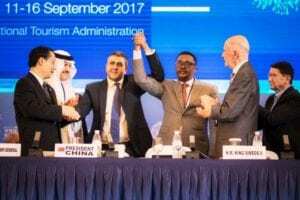 His successor Najib Balala, minister of tourism from Kenya acknowledged his legacy at the last UNWTO Commission of Africa Meeting in which Africa reaffirmed its support for his candidature for the post of UNWTO Secretary-General position. Dr. Mzembi honorably lost this election by a two-country margin on behalf of Africa. Where is Africa when one of its own is being persecuted? The prosecution or better persecution of such a distinguished African citizen is a negative exercise for global tourism, it’s negative for Africa and specifically Zimbabwe. Dr. Mzembi is a resource that any Government and Africa should exploit to its advantage. How do you reconcile this with the way the new dispensation in Zimbabwe is treating Walter Mzembi? Walt Mzembi brought the global tourism family attending the UNWTO General Assembly in Chengdu, China to a five-hour gridlock insisting on the procedure on the affirmation of the now Secretary General. It ended with him compromising and giving his concession speech din with humility he congratulating his rival, the current UNWTO Secretary-General Zurab Pololikashvili. Former Minister Mzembi and for a decade steered Zimbabwe through the most difficult period and got many endorsements for his country. He has been seen as a true patriot that it makes us wonder why such good deeds could be so easily forgotten on the expediency of a new dispensation in Zimbabwe. According to Myanmar Ministry of Hotels and Tourism, the country has received fewer tourists than expected this year.